Embury got this one right. Unlike his other recipes I don’t have to change this recipe much to make the cocktail I’m looking for. I like my Old Fashioned slightly sweeter, but not too much. Also, I like the amount of bitters in this recipe, but I really like the flavors that the Fee Brother’s bitters add, so I’m thinking a mix may be in order. Finally, the lemon twist isn’t adding much other than a nice bright color. After watching Robert Hess’ great video on the topic I agree that an orange twist would compliment the sweet flavors in this cocktail better than lemon. 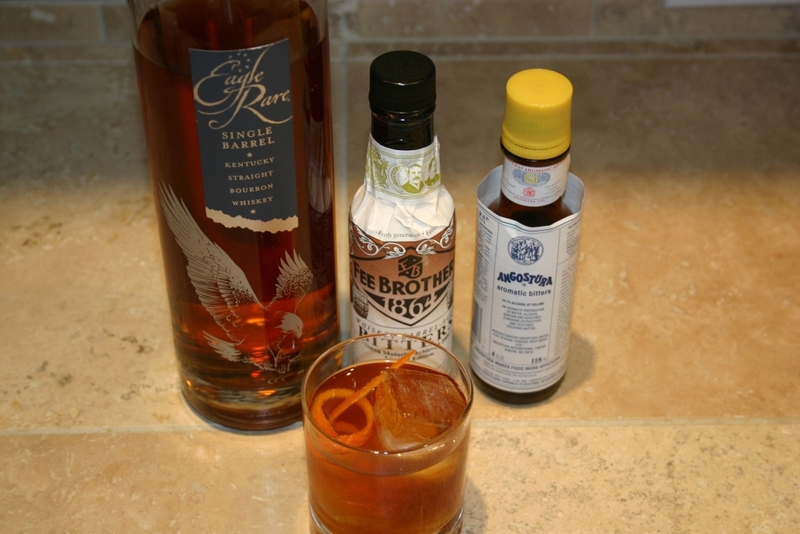 Given these considerations, here is the Old Fashioned that I made Tuesday night. Hmmm…still not quite there. This recipe was a little sweeter than I like. Probably decrease the syrup to 2 tsp. Also, as you can see in the picture I’ve started using my Tovolo Perfect Cube ice cube trays. I’m using filtered water to make the ice, but I’m still getting some cloudiness. Look for more on my quest for perfect ice in the coming weeks. Ice is essential to a good cocktail. In the case of drinks served over ice, good looking ice is also a nice visual touch. As I’ll discuss in detail in a later post I’m on a personal mission to create the perfect cocktail ice at home. One of the requirements of what I deem good cocktail ice is a nice shape. Picture, if you will, a wonderfully created Tom Collins served to your guests in a tall, thin Collins glass over the little milky crescents that your freezer pops out. Just doesn’t seem quite right does it? The Tovolo Perfect Cube Ice Cube Trays to the rescue! 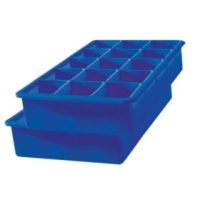 These ice trays produce nearly perfect cubes about 1.25″ on a side. The trays are made of food grade silicon so they won’t pick up weird freezer smells and as such won’t impart those scents to your ice. They’re easy to fill and although they appear somewhat floppy once full of water they’re not too bad to handle. The only problem I’ve run in to is that the ice is a little more difficult to get out of the trays than with a standard tray. You can find the trays on Amazon.com, at Bed, Bath and Beyond and other retailers. At about $10 for a pair they’re worth the investment. 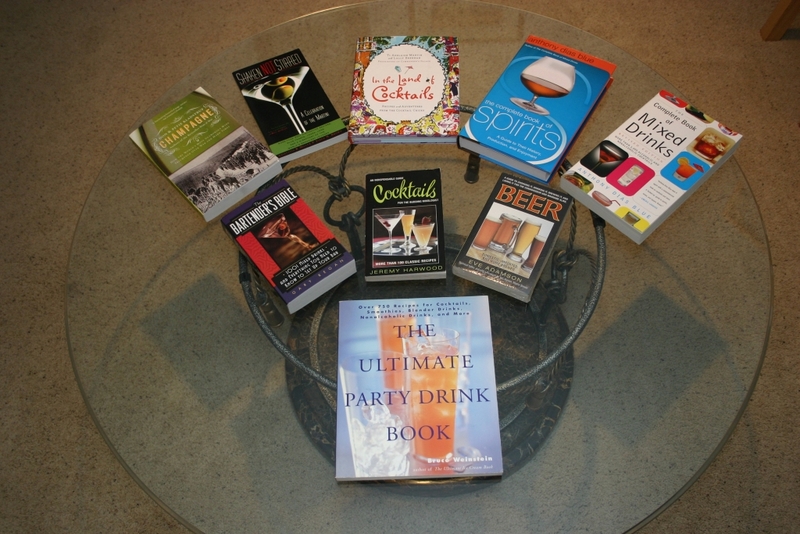 And they’re a great step toward making your home cocktails even more elegant and professional. Comments Off on Christmas in July!!! Well we’ve reached the last of Embury’s Six Basic drinks, the Old Fashioned. 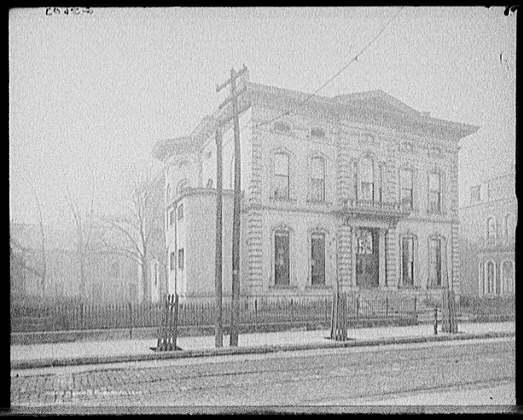 Per Wikipedia, the Old Fashioned is thought to have been created as a Bourbon Whiskey cocktail at the Pendennis Club in Louisville, KY. Then popularized by distiller Colonel James E. Pepper and later brought to the Waldorf-Astoria Hotel in New York City. 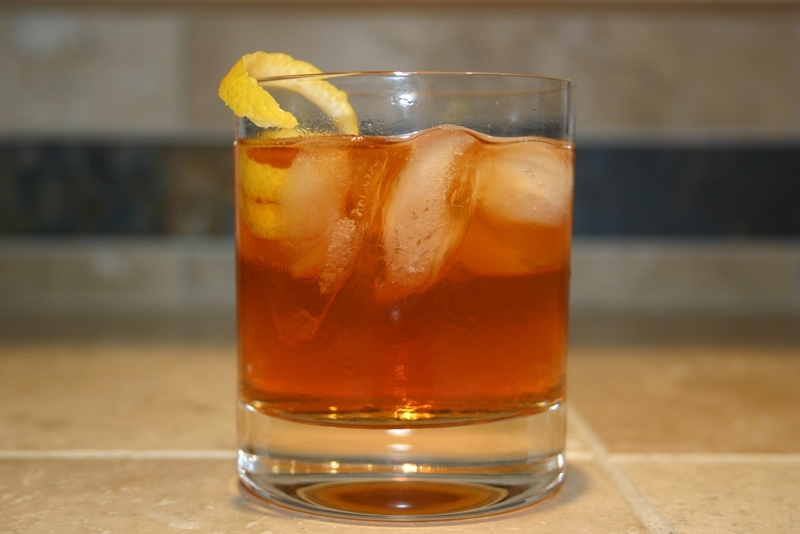 The Old Fashioned is truly an exercise in elegance through simplicity. That’s not to say that it doesn’t need to be crafted with just as much care as a more complex recipe. Robert Hess explained it thus: “When properly made, this cocktail can represent the pinnacle of the bartenders trade. When done improperly, which is more often the case, it can be a disaster of mediocrity.” Robert also has an incredible chronology of the Old Fashioned at his site. Embury’s Recipe holds true to the first known recipe (see Robert’s site, linked above) but adds a speared Maraschino cherry as a garnish. Or in a more digestible format. This cocktail is the only one of Embury’s basic drinks that isn’t served in a cocktail (martini) glass. Rather, it’s served in an Old Fashioned glass, named for the drink served within. You can also use a small water/juice glass in a pinch. The key is to not use a glass that’s much larger than the volume of the cocktail, it won’t look quite right. After making the other cocktails we’ve covered you have all the ingredients you need, but here’s a quick run down. The tools you’ll need are very simple. I came in to this week not knowing anything about the Manhattan. I had never had one, nor had I had any other cocktails that use Sweet Vermouth. To some extent I had a very twisted picture (or is that taste) in my head as to what the Manhattan would bring to the table. From the previous week’s experience with the Martini I was expecting a very sharp herbal bite from the Vermouth that simply isn’t there in Sweet Vermouth. Yes, there is a nice herbal flavor but it seems almost deeper and darker in some ways. Add to that the wonderful flavors of whiskey and you’ve got a total winner. Aaron decided not to participate this week, so I’m going solo on this wrap up, but I think I have some interesting stuff to share with you. I started the week in Grand Lake with my Stepdad (Ken) and two of my Stepbrothers (Pete and Tom). We had a very long day of working in the forest on Saturday cutting down and removing dead trees. So, when it came time for happy hour everyone was ready for a Manhattan. Seeing as I had never had one I started with a recipe I had seen in a number of places. After our first installment we decided that this drink, referred to as “Brown Mumblers” by Pete’s coworkers, was a recipe that needed sampling several times. Thankfully I had brought sufficient ingredients to make such an endeavor possible. We tried both Van Winkle Family Reserve Rye and Eagle Rare Bourbon for the base spirit and found both to be fantastic. I prefer the Rye personally as it gives the drink more of a spicy bite, but I assure you, you won’t be disappointed with either choice. As for Vermouth I brought bottles of Noilly Prat and Cinzano. They are more or less on par, but I think my house Sweet Vermouth will likely become the Cinzano as it has more depth of flavor. I also brought along both Angostura and Fee Brother’s Barrel Aged Bitters, both are great but lead to a different end cocktail. I’d recommend trying both as you will likely have a preference for one or the other. Or, if you want to get super crazy, do what I do and combine them. More on that later. As I discussed in my previous post this week I don’t much like abnormally colored and deathly sweet maraschino cherries, so we passed on those entirely. The drinks soothed our aching bodies and lead to a very pleasant evening. There was even some drunken fishing involved, which I must say is a good time. Pete caught three fish, I caught none, for those keeping score. I also sampled a number of other recipe variants throughout the week. 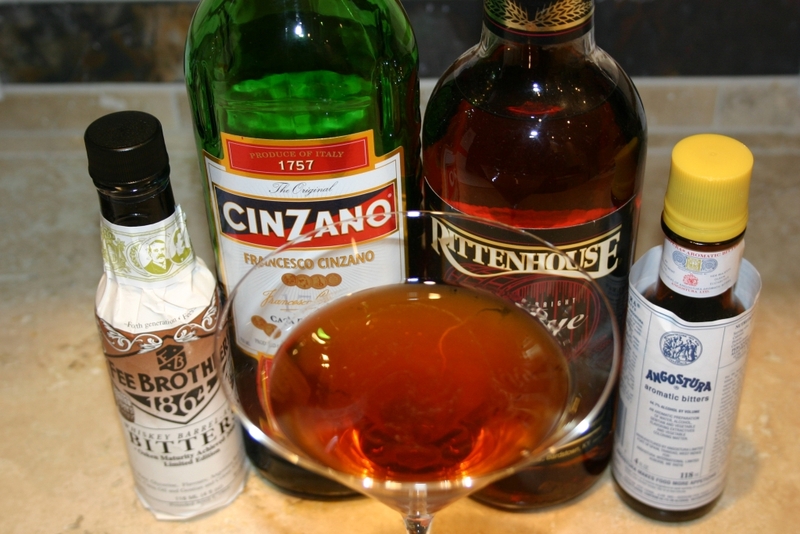 For each of the following I used Eagle Rare Bourbon, Noilly Prat Vermouth and Angostura Bitters to be consistent. This drink was good, but very strong on the bourbon, which is great when you have a good bourbon. However, if the bourbon you’ve got isn’t top shelf this isn’t the recipe I’d choose. Also, the bitters, being such a small amount, don’t really come through as much as I’d like. Same holds true for the amount of Vermouth. The drink is not particularly sweet as a result and little of the herbal notes shine through. Overall, not my choice. A tasty combination overall, but not what I would call a true Manhattan. The flavors of the Vermouth (Noilly Prat Dry) and Bourbon come through nicely but this drink lacks the sweetness I like in a Manhattan. Onward! I really like this recipe and it’s very near my preferred recipe. The Vermouth adds the sweetness I crave and the bitters are there in sufficient quantities to bring a lot of flavor to the party. Since we believe if full disclosure here at Cocktail Hacker, I should mention that I didn’t have any maraschino cherry juice at the time which would have bumped the sweetness level up even further. Reese's Manhattan - Minus the Cherries - D'Oh! 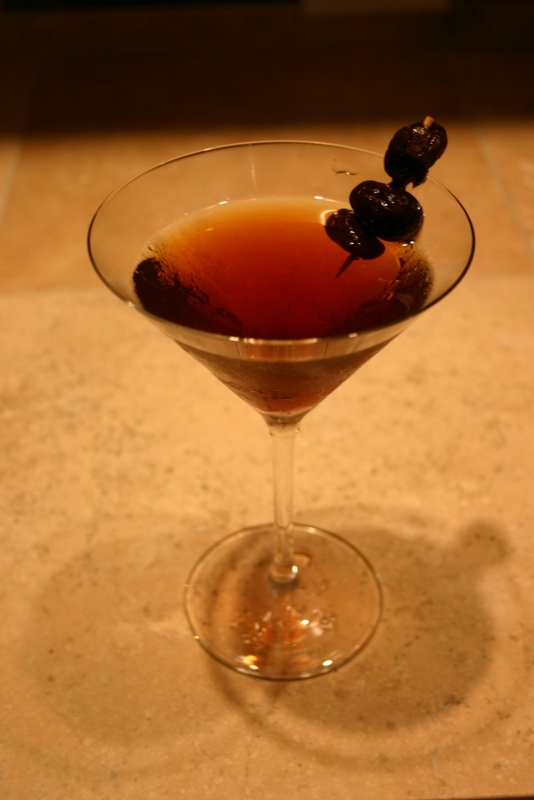 My favorite Manhattan recipe for the week is very similar to the Difford’s Sweet Manhattan, with a couple small twists. I change up the bitters by using both Fee Brother’s and Angostura. I really like the additional cinnamon and clove notes that the Fee Brother’s adds. I also don’t use the cherry syrup but bring up the Vermouth ratio to maintain the sweetness. Furthermore, I go with Rye Whiskey over Bourbon as it brings the spicy flavor I mentioned above. That said, this recipe works very well with Bourbon too. For the garnish, use a maraschino if you must, but I would really encourage you to try making your own brandy soaked cherries. They are truly fantastic. I used dried bing cherries for my batch but I think I’ll use dried (or frozen) sour cherries next time for some added twang. That’s all I’ve got for this installment. I hope you enjoyed your Manhattans this week as much as I have. Next week is our last Embury cocktail, the Old Fashioned.